The Cape Henlopen High School golf team began its 2016 season on March 23, too late for a report in this week’s column. To commemorate the start of the Vikings season, here is a story from the 2015 U.S. Senior Amateur that may also help with their performances in the next few months. 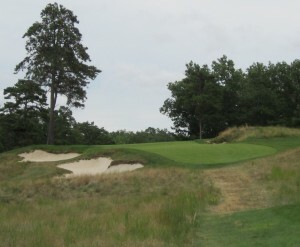 The 11th hole at Hidden Creek Golf Club, site of the 2015 U.S. Senior Amateur Championship. During the Senior Amateur’s match play Round of 16, I stood by the 11th green and watched how each golfer played the short, uphill par-3, with its false front, pot bunkers, fescued mounds, and other challenges to success. As far as scoring, the group did well. There were several birdies, and the rest were pars–no bogeys or the dreaded “others,” even for those few who missed the green. What became more distinctive among the players was the wide range of attitudes on display. Many were quietly serious. A few were visibly annoyed, especially if a birdie putt didn’t go in. Others were noticeably angry as they approached the hole from the tee, a sign perhaps of troubles on the 10th hole or somewhere previously in the round. Of all sixteen, only one pair of golfers acted like they were having a pleasant regular round of golf, smiling and chatting with each other–and they were the last two of the day. Jack Hall of Savannah, GA took 20 holes to win his morning Round of 32 match, forcing a pushback in his starting time against Tom Brandes of Bellevue, WA. Brandes had won his match that morning against Paul Simson, a former two-time Senior Amateur champion, 1-up. Brandes is a four-time winner of the Washington State Senior Amateur, and reached the Sweet 16 in last year’s U.S. Senior Amateur. Hall reinstated his amateur status in the 1980s and won several Georgia amateur events, including the state’s 2013 Senior Amateur. He is also a veteran of several USGA championship tournaments. Hall and Brandes hit decent approaches to the green, each with less than 20 feet for possible birdies. They complimented each other, and moved easily about the green as they prepared for their shots. Brandes hit first, a cross-green putt that arced to the left and came up well short of what he expected, leaving a 4 1/2 footer for par. He was surprised, but gave no hint of annoyance or anger, which set him apart from some of his competitors. Hall had an uphill putt for his birdie, and put a good roll on it. The ball stopped less than an inch from the hole, and then rolled backward a tiny bit. Hall, also surprised but not annoyed, suggested to Brandes that his ball must have had some backspin on it. The two chatted some more as they returned to their carts for the rest of their round, which Brandes eventually won, 1-up. The way Hall and Brandes behaved during that hole was just right. Both highly skilled amateurs with significant national competitive experience, they still managed to remember that they were playing a game, and acted that way. Brandes continued to have fun in his next two rounds. He defeated Patrick Murphy of Provo, UT 5 and 4 in the quarterfinal round, and went to 21 holes before winning the semifinal round against Steven Liebler of Irmo, SC. Against Liebler, a former PGA Tour player and now a noted South Carolina amateur champion, Brandes made a four-foot birdie to be only one down at the turn. Liebler’s only bogey of the day, on the 13th hole, brought the match back to all square, where it stayed until the 21st hole, a par-five. Liebler laid up for his third shot to 109 yards, by his reckoning. From over 235 yards out, however, Brandes hit an admittedly thin three-wood over a yawning bunker, on a line that required a 210-yard carry to avoid disaster. His ball shot forward, over the greenside edge of the bunker, and rolled to a foot from the green. Liebler’s third shot spun back on him to 25 feet from the pin. Brandes hit a nice chip to one foot for the conceded birdie, and Liebler was unable to convert his birdie putt, ending the match. Brandes was rewarded for his bold approach, but also he said he would have “shaken Steve’s hand” and conceded if his ball went into that bunker. For Brandes, after all, it really is a game. 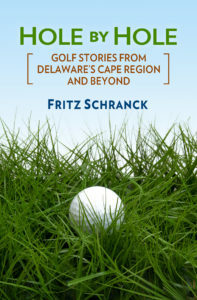 In the finals, the week of multiple rounds of golf seemed to take its toll on Brandes, when he lost to Chip Lutz of Reading, PA. The Washington golfer hit into an unplayable lie on the first hole, leading to a double bogey for him and a conceded birdie for Lutz. He was never able to bring the match back to all square. More bogeys on the 4th, 11th, 13th, and 15th led to defeat.